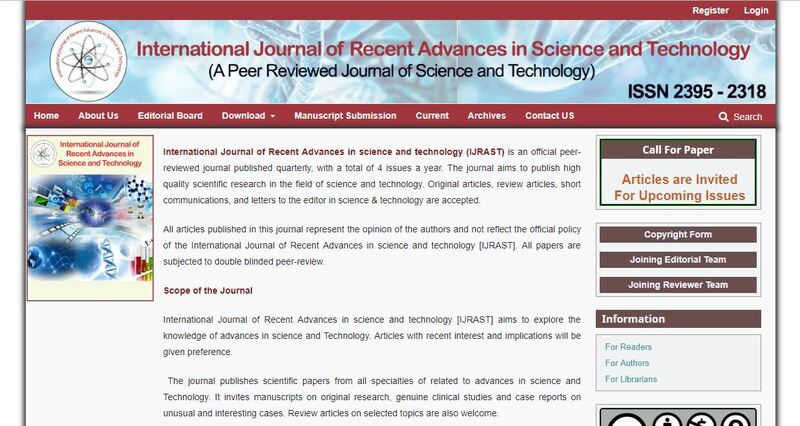 International Journal of Recent Advances in science and technology (IJRAST) is an official peer-reviewed journal published quarterly, with a total of 4 issues a year. The journal aims to publish high quality scientific research in the field of science and technology. Original articles, review articles, short communications, and letters to the editor in science & technology are accepted. All articles published in this journal represent the opinion of the authors and not reflect the official policy of the International Journal of Recent Advances in science and technology [IJRAST]. All papers are subjected to double blinded peer-review.